Here are the answers to the guess the stitches post. 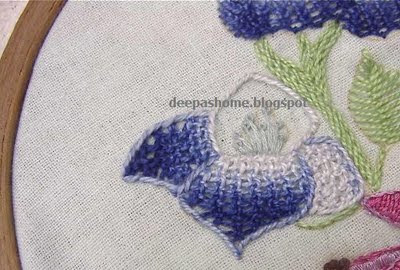 I've used Ceylon stitch for the top flower. I had to use Anchor perle cotton for this one since I found the stranded threads a bit difficult. That's why the heavy look. Ceylon stitch is best done with perle cotton type of threads ( those which cannot be split) . Since the bottom flower was more opened out repeating Ceylon stitch didn't seem suitable . And so attempted the detached buttonhole/blanket stitch with outline stitch . It doesn't look bad, does it? The stem is filled with stem stitch. In BE this method of filling is called heavy stem stitch. 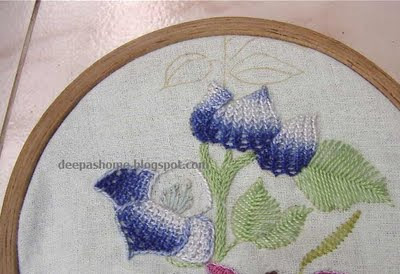 The leaves are made up of Open fishbone stitch. OFB is slightly different from the regular fishbone stitch. Check out this link for the stitch method. I think it all looks great, although with Miss 376 I prefer the top flower's look. Why not print out some of the lovely photos you've posted this year as cards for your friends? 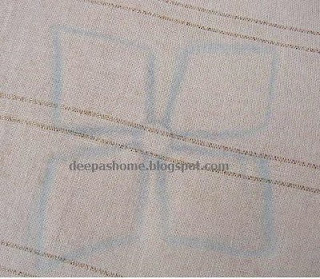 deepa.. bed linen is very beautiful.. and i liked ceylon stitched flower and heavy stem stitch.. This is a plain cotton bedsheet I bought from one of the stores. Not a very high priced one,but quite ordinary material. When you do up a bedsheets and choose the design to be embroidered how do you duplicate the pattern?I feel at a loss to finish the whole rectangle.